Since Halloween is most popular in the U.S., we focused on queries there — but we did investigate searches in Canada and the U.K. for good measure. 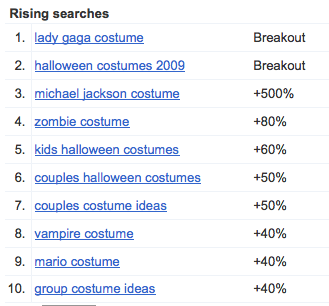 In Canada, people are overwhelmingly searching for costumes for two — variations on [couples costumes] dominate the top 10. 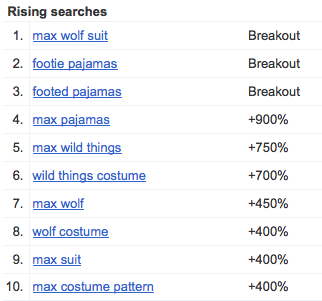 Both in Canada and across the pond, searchers are looking for costumes based on Lewis Carroll's classic story Alice in Wonderland, with [mad hatter costume] in the top 10 in the U.K. and [alice in wonderland] in Canada. Thinking of dressing up your little ones? 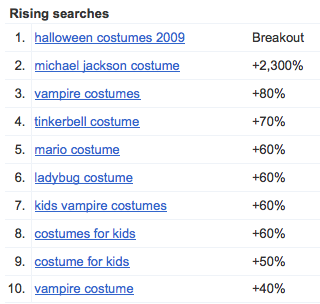 Popular queries in the U.S. related to [kids costume] include [ladybug], [minnie mouse] and [tinkerbell]. As a dog-friendly company, we share the country-wide impulse to dress up our dogs for the holiday. 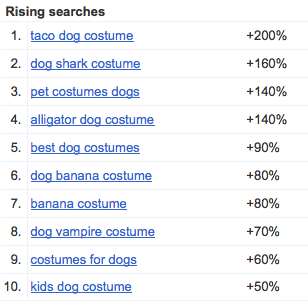 Related searches for [taco dog costume], [dog shark costume] and [banana costume] (so cute!) all rank high. We hope you have a happy Googleween! When it comes to holidays, Halloween is one of our favorites. You get candy corn, creepy crawlies, ghosts and goblins, blustery weather and the goopy joys of pumpkin carving all crammed into one glorious fall fun-fest. It's also the one holiday where you can dress up as whatever you want — your favorite celebrity, your favorite animal or even, like one Googler last year, your favorite gadget. As usual, we're in the process of devising brilliant last-minute costumes, and we got curious about what others around the globe have been searching for in preparation for Halloween.